07vlx propshaft coupling is giving me troubles. How do I get it off. Set screw is out, made a wrench and socket1-1/16 cut down with flat bar welded to it. Is it a right hand thread? I peace the wrench against the v drive and turn the prop as hard as I can but nothing. Tricks? Is it a left hand thread? Set screw is out. Take a look at this thread. It may help. You are on the right track, but it is tough to get that kind of torque at the prop. There was a coupler wrench that someone used to make. I'm still trying to find a link for you, but the thread below walks you through the process. Normal thread left loose, right tight. Key stock is used on the shaft also. You will have to pull the prop shaft coupler off of the prop shaft by drawing the prop shaft flange toward VD output shaft flange. In order to make that happen you will have to place the "special tool" or a crappy socket in my case on the prop shaft nut screwed on to the prop shaft threads to protect the threads. I used some threaded rod, washers and nuts I had in all 4 holes and pulled the flanges together. A ratcheting box wrench works well due to space issues. keep the nut on the shaft to protect everything, it will come screaming off once you get it broke free. I think you need to focus up at the flange. I would recommend using this to soak the nut down, then try an approach like this if you can't find the flange wrench. Pretty sure these guys made one way back in the day. They probably still have the cad stuff for it. 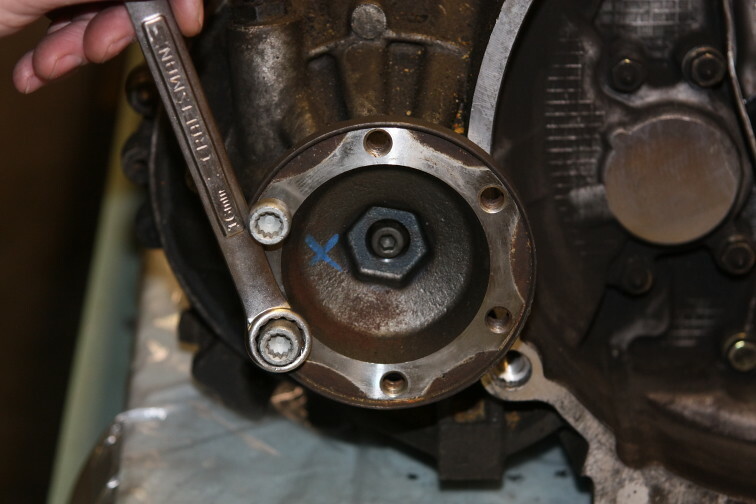 Put some bolts in the coupler, then use a large wrench or something to jam up the coupler while you break the nut loose with the tool that you made. @rugger may be able to help you out. Good ideas above. Usually it takes either a flat bar welded to socket, or cut down the socket to fit inside coupler. I chose to cut down a socket (the drive shaft nut is thin anyway) using a cutoff wheel... then used a long breaker bar with it. Should definitely come off with that much leverage. Lots of ideas on how to keep prop from spinning out there... but if you use a 2x4, make sure its all the way to the inside of prop at an angle where it won't bend the blades. I tried the cut down socket welded to a bar with a 300lb hulk. broke the bar the 1st time then bent it the second time. This was after soaking it in pb blaster for a day. ill have to pull the v drive off this winter to get an impact and heat on it. Ended up pulling the strut to change the bearing. Dripless will have to wait till the winter to be installed.